Rafael Domingo, Spruill Family Research Professor of Law, has a new book, God and the Secular Legal System, published as part of the Cambridge Studies in Law and Christianity series, edited by John Witte, Jr.
Domingo’s goal is to present a coherent constitutional framework for the protection of rights to religion and freedom of conscience in this age of diversity, interdependence, and secularization. Domingo objects to both traditional religious and current liberal approaches to religious freedom. “The traditional religious approach is inevitably exclusivist, while the liberal approach is inevitably reductionist,” he says. 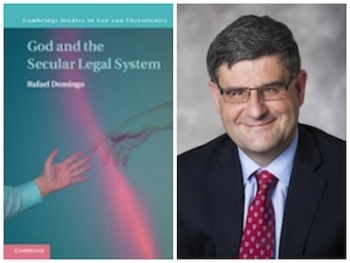 Domingo offers a third path: a theistically oriented conception of the secular legal system that is able to embrace nontheistic approaches. Domingo arrived at Emory Law in 2013 from the University of Navarra School of Law in Spain, where he was a professor of law, and dean emeritus. His research in Roman Law early in his career prepared him to tackle larger issues of law and religion and the development of global law as a concept separate from international law. Learn more about Domingo here and here.